Do you think oil filters bad for the environment? Are Oil Filters Bad for the Environment? The answer to this question is a very big, very loud and very resounding "Yes." Oil filters with oil trapped inside them should never be thrown away to pile up in our landfills. There are also legal/financial reasons to take care of used filters. While those reasons can negatively affect your pocketbook, strict regulations exist for a reason. As an excellent video by David Lucas explains , over 500 million light-duty oil filters are manufactured per year in this country. If only half of those filters wind up in landfills (i.e., they aren't recycled), the end results are 75,000 tons of wasted scrap steel and 9,000,000 gallons of wasted oil that amount to 1.5 trillion BTUs of energy.Per year. And that doesn't even account for the heavy-duty truck oil filters. Oil filter recycling centers, such as Lucas Lane Inc., take old filters, crush them down, and then heat out virtually every last drop of oil. Improperly/illegally disposed oil results in wasted energy that could otherwise be put to good use. We'll explore the environmental impacts of all this waste to help illustrate the scope of the environmental impact oil has on the planet and humankind. At the end of this article, we'll even show you how to profit off your used filters. We've seen the obvious bad effects of oil damage: the birds covered in tar, the cleanup crews slogging through a solid foot of washed-up petrol. What we don't see are the effects 10, 20, 50, even 100 years from now. The components that make up motor oil will persist for many years after old oil has visibly broken apart. The more oil that gets added, the longer-lasting and more widespread the effects. Oil refinement processes also contribute to the presence of mercury in our oceans, which enters our food supply (fish and shellfish). 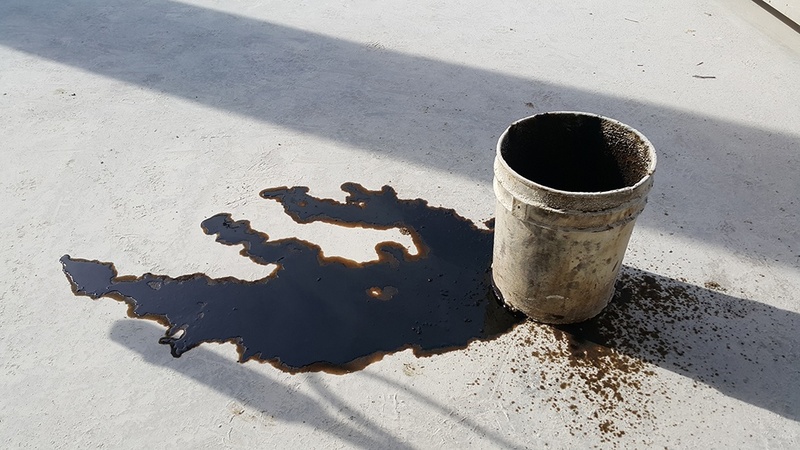 While the long-term damage is not yet fully understood, the impact of the motor oil from used oil filters is undoubtedly problematic. You don't have to be a green-hearted environmentalist to think an annual loss of 706 million gallons of spilled oil into our oceans is, for lack of a better word, gross. A lot of that sticky black stuff can be seen floating on the water at beaches around the world, and a good percentage of it was once motor oil. There are many ways for oil to get in the water. Even though we hear about the major oil spills in the news, it's what we don't hear that's most dangerous. In fact, only 8% of spilled oil comes from those major pipe leaks. Much more comes from the improper disposal of used motor oil. That means every single automotive oil filter is a potential environmental hazard. 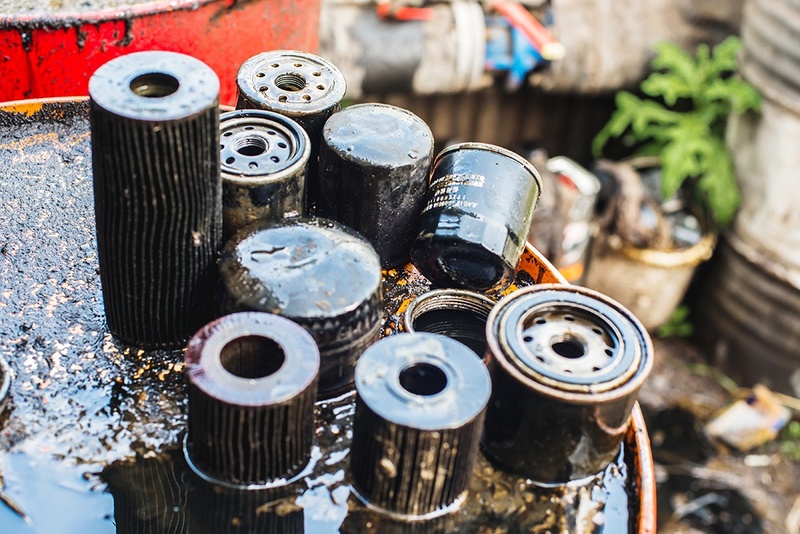 When oil filters have to be transported across oceans and other waterways, oil leaks right onto the surface of the water and winds up plaguing our shorelines. This is a massive disruption to the food chain, as birds, sea mammals, crustaceans, etc. all see their populations affected. Billions of dollars and thousands of hours of labor go into cleanup efforts, just to make the affected areas habitable again. In the meantime, even more billions are lost due to down times at fisheries and other water-dependent industries. In all, these spills create a massive loss of our resources, in both labor and capital. Need to dispose of those filters without breaking the law or hurting the environment? An oil filter crusher will reduce the size of the oil filter, letting you toss more filters in a recycling receptacle than would otherwise be possible. Better yet, the crushing process expels oil from the can, clearing out 95% of the residual oil. At that point, the metal is fit to be considered scrap and can be recycled for a profit. The oil itself can be recycled in many ways. Many facilities will take care of it for you and use it to make asphalt or other oil-based products. 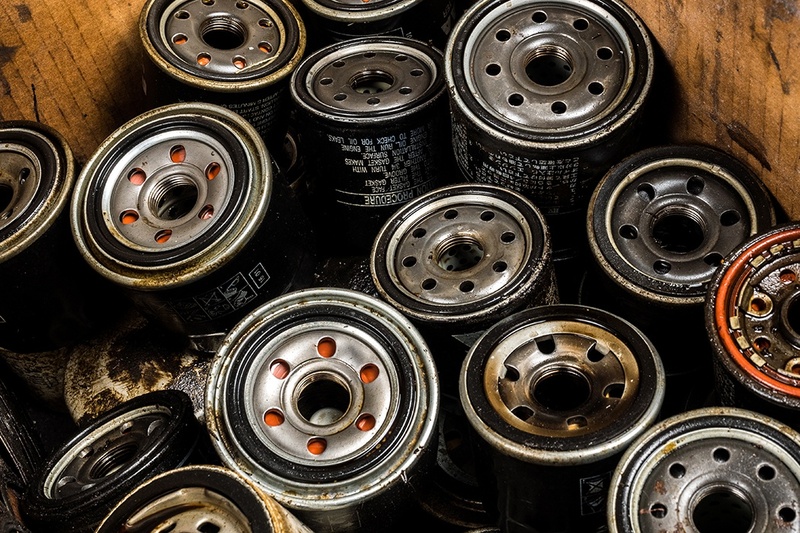 An independent auto shop doesn't need to fret about incurring large recycling and disposal fees. Ranger's industrial grade oil filter crushers will offer many years of dependable service. You'll also be protecting the environment, reducing the cost and hours that go into oil-related cleanup efforts, and earning a little extra profit in the process. It's a win-win-win. Plus... and this is important... draining and recycling oil filters is the law!